Houston’s Got Bollywood with Naach! Added by Indo American News on April 7, 2017. HOUSTON: India House and Naach Houston start off the Season with a brand new production celebrating the global spirit of Bollywood Dance Theater in this spectacular presentation of “Houston’s Got Bollywood – The Red Carpet” Conceived and Directed by Dance Maestro Mahesh Mahbubani. The show opens at 8.15 pm on April 15, Sat, at the one and only Miller Outdoor Theater, Free Tickets and Free parking. The Production design includes a lavish wardrobe of Exotic costumes, designed by Bollywood Costume Designer Bipin Tanna, all the way from Mumbai the heart of Bollywood. 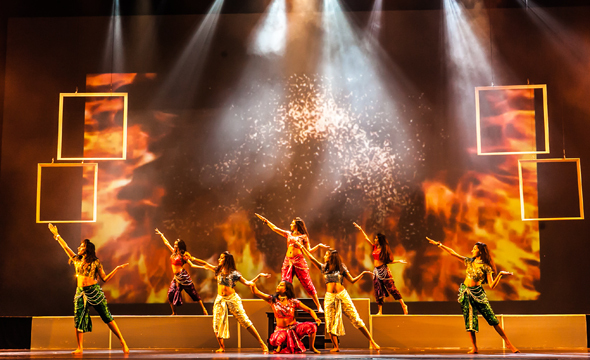 Innovative choreography, dynamic dancers and breath taking visuals, and Magical lighting By Arif Memon, the show is woven together in a true Bollywood Theatrical style. There are four acts to this fast paced and Hi energy dance theatre Production. Act 2, Night at the Movies – a tribute to the spirit of Bollywood Cinema. This act will showcase a variety of songs and dances using different situations from Bollywood films. Act 4 capturing the sheer essence of a Bollywood Super Star. We thank our sponsors, Chi St Luke’s Health, Ajay & Larrissa Sharma , Rungta Foundation & Outsource Energy. For over a decade Naach Houston has been presenting some of the best Bollywood Theater production Houston has seen. These shows have been proudly conceived and executed by the local talent of the Bayou City. Houston has Naach and thus Houston’s Got Bollywood.